The machine is used to simulate reactions that take place in the stars. A particle accelerator uses electromagnetic fields to propel charged particles to high speeds and to contain them in well-defined beams. Wiescher notes that most of the human body is composed of hydrogen—about half of which was formed 12 to 13 billion years ago in the Big Bang and the rest in later generations of stars. The machine is being used primarily to expand the research program of Notre Dame's Institute for Structure and Nuclear Astrophysics (ISNAP)and the Joint Institute for Nuclear Astrophysics(JINA). The 5MV is the latest in a series of particle accelerators that have been used for research at Notre Dame, with the first one installed way back in 1936. Two later accelerators - one from the 1960s and another from the 1990s — remain in use in Nieuwland. 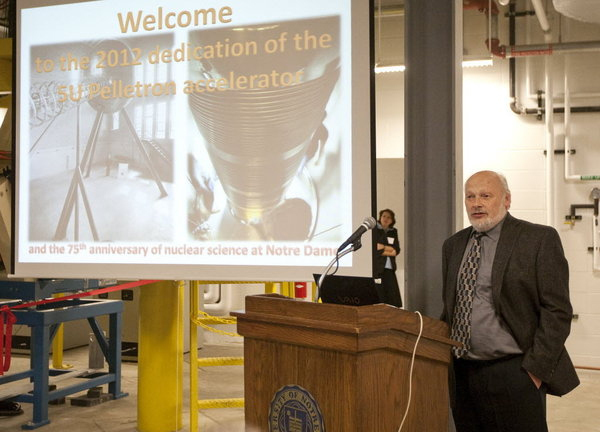 Photo: South Bend Tribune/ROBERT FRANKLIN Lab Director and Physics Professor Michael Wiescher speaks during the dedication of the 5U Pelletron particle accelerator inside Nieuwland Science Hall at Notre Dame on Thursday, November 1, 2012. Originally published by Margaret Fosmoe, South Bend Tribune at physics.nd.edu on November 02, 2012.